We spotted this Step 2 Sand and Water Activity Table on our way to the doctor. 2 hours later, it was still sitting at the curb. Do I dare trash pick in such a fancy neighborhood? I wedged it in the trunk, just as the garbage truck barreled down the street. It almost made all the fever worthwhile! I love curbside shopping! It's great for the envirionment and your wallet. I'm surprised it was still there after 2 hours! Great find! Those are very nice. I know I do not have to tell you this, but for others who might not know, you will need to cover the sand when not in use. (I use a tarp) This keeps the neighbor's cats out of the box. No nasty surprises. This toy is probably the best purchase I have made since my kids have been around. We use it inside in the winter. Those are the ONLY neighborhoods in which to trash pick :D A family friend tells of neighborhoods in his area of Idaho (Sun Valley) where people put expensive, once- or twice-used skis on the curb because this year's model has been purchased. Their foolishness is my gain! Oh that is awesome!! Happy for you but admitting I'm jealous! A good reminder to keep eyes peeled on garbage day! That find is worth picking trash in any neighborhood -- wow! I'm happy you "dared"! Why not?? In fact, I think that people put things out a lot of times because they are sure someone will use it -- not because they really want to trash it! HOW DARE YOU! Yipee - so glad you dared. :)What fun your kiddos will have this summer. Even with the toys we got for it($1 section of supertarget)--all in all cost $25!! However....free is always better! We used to live in a very upscale neighborhood. In nice weather, Christopher and I would take our walks early on trash day. Oh wow, that is a GREAT find! I am amazed what folks put out for trash! Not having kids, I have no idea what that is. 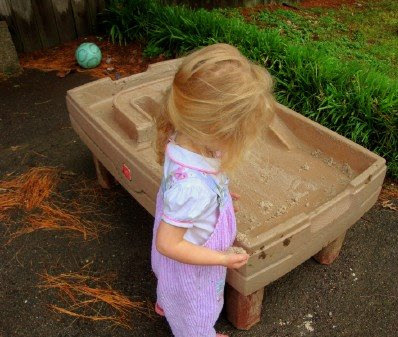 A sandbox? Water table? Whatever it is, I'm glad you found it! Hope your kids enjoy it. I have had people knock on my door and ask for items placed on the curb and I have had people just remove what they want . It's fine if someone else can use it and they don't leave a mess for me to clean up . My MIL trash picks the best stuff... she has gotten a water/sand table, a little tykes min cooper car and a wooden+plastic bins storage unit for my son. All in great condition and all free! a post after my own heart. curbside shopping is the best. (free is my favorite word!) i had to by pass a big outdoor playhouse the other day....too big for the car and the yard. boo hoo...just hope it doesn't end up in a landfill! It's called Dumpster Diving by my brother and "You go Girl!!!" I love finding stuff like that. Our old town used to have a big trash day twice a year where there was no limit on the large items you could put out. We got some great stuff at that time of year...and I'm sure people thought that about our 'trash' too. Wonderful. You make me smile. My favorite old wheelbarrow came from the place you took your trash to in the country. I pulled in behind someone who unloaded it and I loaded it. The supervisor on site replied "you want that old wheelbarrow" I replied "yes - it is a treasure" Still have it and plant flowers in it. Just a note to your readers to be careful it's trash. We had a neighbor who dove through our donated items that we had scheduled for salvation army to pick up. Large items that we wanted to write off on our taxes and that shelters can really use. When the truck got there, the desk, office chairs, rocking chair and toys were gone. The next week, I saw said items in neighbor's garage. How sad to steal from a charity. The items had a sign clarly marked for the salvation army. Actually it bothers me most that all these garbage finds weren't donated in the first place thinking of landfills and wasted resources. How lazy can they be. I am so glad to hear you made a wonderful find before it truly was trashed. Also, I've found the best garage sales in those rich neighborhoods. Great finds for pennies. Solid wood coffee tables for $5. Love love love it! And I love that you took the trash! :) Some of my best finds have come from someone's trash! Good point. If I had a charity picking up my stuff, I would put it on the porch--not the curb. This was a lone table and a broken pot set out by the trash cans, clearly in the ditch. I used to find good stuff curbside but when our city switched to big municipal trash bins, they quit picking up anything that isn't in the can. As a result, I rarely see items set out by the cans any more. I would never reach in someone's can but I would certanly look twice at an item set next to it. I think in most cases the owner hopes someone will take it, especially when they know it will not be picked up by the truck unless it is in the can. Very cool find! I love trash picking. We got our turtle sandbox that way. There is not a thing wrong with it. It is so amazing what people throw out! That's also a good point, Meredith. There are definitely regional variation on trash pick up. Here in the Seattle 'burbs area, they pick up small items and even smaller broken furniture on trash day for a fee if you call ahead. As for our donated items, our old house had no porch to speak of and these were big itms, so I had to put it on the sidewalk between my and my neighbor's house on a non-trash day with no garbage cans in sight.. But I also put signs all over the stuff that it was for Salvation army. It put a real strain on the neighborly relations because I was angry, but didn't want to cause waves. I also felt pretty guilty the Salvation Army made a special trip for my stuff with gas very costly at th etime and all they got was a couple boxes of knick-knacks. I agree totally with your situation. No way would regular trash guys pick up such a big table unless they were hoping to score if for themselves. :) I've known several guys in the industry and oh the stuff they would pick up that was still good and working. WE call that junking. In Germany there are two times a year that everyone is encouraged to "put out the big things". It is an evening of enjoyment to go around and look. Sort of like thrift storing without the store or money! I definitely would have picked it up. What a great find! Another fine example of 'recovering quality goods' - without spending ONE dime! Way to go Meredith!!!! TOOTS for YOU!!!!! I am keeping my eyes open for discards as well. I agree that often times people are hoping their discard will find a good home, I've both picked up and put out. Here in Sacramento we used to have the annual big trash pick up day and the official city & county policy was that salvaging/recycling were banned. With the advent of freecycle and craigslist people were posting when their neighborhood was having pickup day so to put a stop to that the city and county switched to having individually scheduled pickup appts once a year. The short-sightedness boggles my mind. How hard would it be to send a sweeper truck through each neighborhood after its' turn? I guess I'd better get fired up to write some letters! I agree that it's recycling! I totally would have stuffed it in my vehicle too! We have that exact sand and water table. This is one of the few things we actually bought new. It has been worth every single penny and then some. One of the few things that entertains her for hours, year after year. Great find! OMG! I just spend $70 on one of those Wednesday! I only put sand in ours, though. If the sand got in the water, the OCD Mama in me would freak.